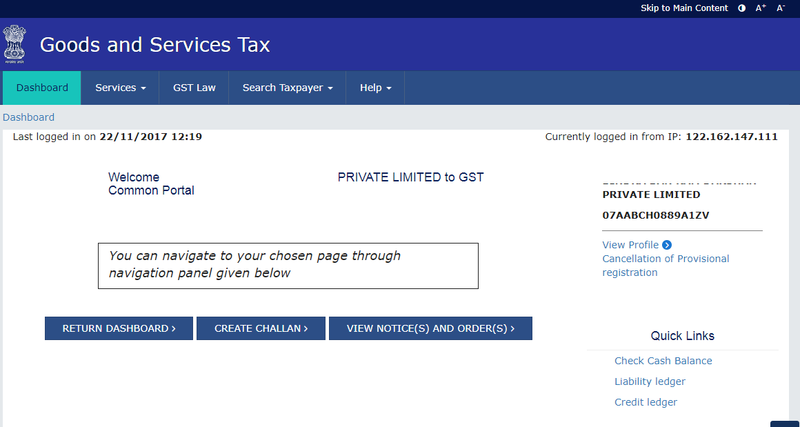 Home / GST / How to Cancel Provisional Registration under GST? How to Cancel Provisional Registration under GST? As part of migration from previous tax regime to GST, all taxpayers registered in the previous tax regime were auto-migrated to GST. This was irrespective of whether the tax payers are liable to register under GST or Not. Taxpayers who were auto-migrated and given a provisional GST registration but who are not liable to register under GST can now cancel their provisional GST Registration. Persons who have received a provisional GST Registration but have not issued GST Tax Invoices under GST can follow the below simple process to cancel their provisional registration under GST. Enter provisional ID and password you have received in your registered email id. Once you login, you have to create a new username and password of your choice. Once this is done, login using the new user name and password. Click on cancellation of provisional registration. Select the check box for declaration and click submit. You will receive email about cancellation of your provisional registration successfully. Login to your GST Account. You will see option of "Cancellation of provisional registration" on the right side of the dashboard as shown below. Click on this. Form for cancellation of provisional registration appears. Specify the Reason for cancellation. In the field "Have you issued any Tax Invoice in GST Regime", Select No. Submit the application with Digital Signature or EVC. Persons who have issued tax invoice in GST. The business has been transferred fully, amalgamated, demerged or disposed off.